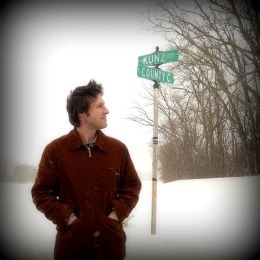 Drew Kunz, originally from Wisconsin, is a Bainbridge-based writer and artist. He is editor and publisher of the journals Track & Field and Miniature Forests, as well as a chapbook press project t.a.p./SERIES. He has also authored two e-books - Tether (2007) and Terminals (2008). The latter, available in hard-copy, is reviewed by a reader as follows: "A micro-chapbook in the form of a single poem of 23 minimalist 'entries'. There's a 'scientific' sensibility at play here with many mathematical terms artfully employed - point, line, rectilinear motion, parallels, acute angles, trapezoid, etc. - but the poem is also the history of a very human relationship in its essentials. ... The poem is all very clear and refined and precise, without at all being precious, and filled the head of this reader with airiness and thoughts." For more information on Drew Kunz go to either http://en.wikipedia.org/wiki/Drew_Kunz, or http://drewkunz.carbonmade.com/, or listen to Kunz read one of his poems on http://www.youtube.com/watch?v=0YU7Rzf9peY.